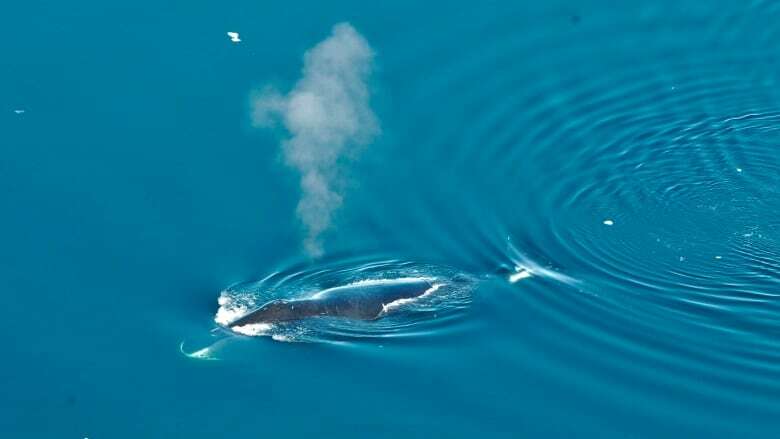 Lauren McWhinnie is the lead author on a study that says there is a window of opportunity to address the harmful effects of increased shipping on the whales' environment before they become more threatened. "In most situations we kind of employ this fire fighting technique when it comes to conservation with animals," said McWhinnie, who is a researcher at the University of Victoria. "But up there, this is our chance to learn for once, and hopefully be proactive." McWhinnie's research group looked at different vessel management schemes that might be adapted for Arctic waters. The group studied over 1,000 marine protected areas and identified 14 different tools across four categories that would be suitable for the Arctic. "We have spatial tools, vessel tools, and monitoring and outreach tools, and what the study suggests is you should look at employing a suite of tools, one from each one of these tool boxes to be effective" she said. "With the longer season that's ice-free there's more time for those types of those vessels to go through, and we know they're the kind of vessels, particularly for ship strikes, that pose a danger to bowheads" she said. "The resulting extended 'open water' season has many implications for vessel traffic and marine life," the study says. "There's a spatial and temporal overlap to the shipping season up there and the whales' season," McWhinnie said. "It's a whole ecosystem that's potentially going to be facing these changes, because of the sea ice there are other conditions, the warming of the water as well they're already contending with, the vessel traffic is a low-hanging fruit." "Unfortunately that's the $36-million question."